The feel good Christmas musical is based on the 1954 Bing Crosby film classic. 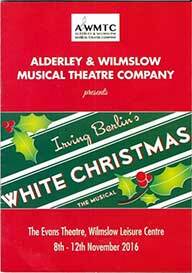 It is brimming with Irving Berlin hits like, “Blue Skies”, “How Deep Is the Ocean?”, “Happy Holiday” “Sisters” and, of course, the unforgettable “White Christmas”. Two buddies, veterans of the Second World War, are a successful song and dance duo, Ben Wallace and Phil Davis. They were played by Matt Darsley and Richard Ross. Both had the voices to deliver Berlin's wonderful songs. Matt worked especially hard to bring truth to the character. It doesn’t take long before the interest of the boys in the beautiful singing Haynes Sisters blossoms into romance. Ruth Moore was Betty, and Eileen Rawlinson was Judy. Both these performers were convincing and captured the musical style of the era. All four of them end up at a Vermont ski lodge which happens to be owned by Ben and Phil’s former army commander, General Henry Waverly. The ever reliable Bob Chaloner brought experience to the role of the crusty General. Susan Waverly, granddaughter of the old campaigner, was charming and engagingly played by Milli Patel. The day to day running of the lodge is in the capable hands of ex Broadway starlet, Martha Watson. Alison Brander as Martha covered all the bases with her delivery of (“Let Me Sing and I’m Happy”). As it is an exceptionally warm season there isn’t any snow for skiing the result that Henry Waverly is facing ruin. So Bob and Phil, plus the girls, decide to put on a show at the lodge. This creates plenty of opportunity for some colourful characters. Including Rita (Lauren Spiers), Roda (Sarah Baily) and Ikaro Grittins (Ralph Sheldrake) and not forgetting the ensemble work. In true Hollywood style and unbeknown to Waverly, the boys invited their old regiment to the opening. The general is overwhelmed when brought on stage. The show is a success and they all sing "White Christmas" as the snowflakes begin to fall. Irving Berlin’s score is dazzling: no wonder he is called “The Dean of American Songwriters”.